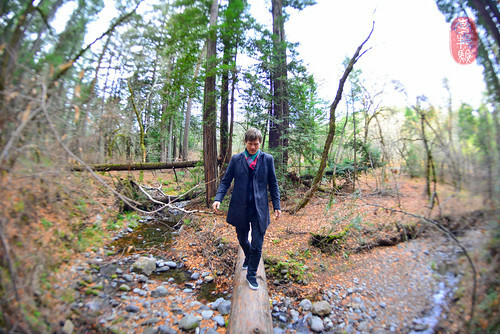 The woods above Napa Valley were quiet when we arrived mid-morning. Cameron Rahtz, the resident forager at The Restaurant at Meadowood, took us up and off a trail, teetering across fallen trucks and trickling creeks, into a thick carpet of leaves. It’s been a dry year here. Last year, the Napa Valley saw close to thirty inches of rain. This year, barely ten have fallen. So, we knew that the chance of finding mushrooms – especially matsutakes, which Rahtz and I hauled in last year by the bag-full – would be slim. But, we did find red bay (that smelled of spice and pink bubble gum), and mossy logs overgrown with oyster mushrooms. There was an abandoned orchard with a few, dried apples still hanging, and wild herbs everywhere. Rasmus Kofoed, chef of the Michelin two-starred restaurant Geranium in Copenhagen, and the only chef who has won all three statues at the Bocuse d’Or, marveled at the beauty, at the aromas, at the textures in these woods. A continent away from home, he told us that these woods reminded him of his childhood, much of which was spent in the woods of Denmark. He tugged at Spanish moss, asking if it was edible. He collected twigs, crusted with dusty green lichen. 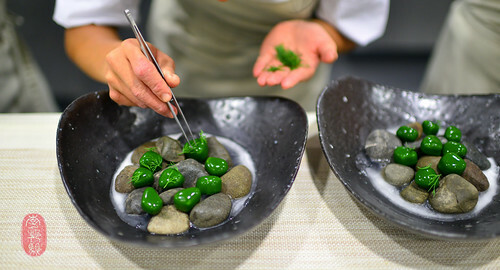 And he asked Rahtz if he could gather enough rocks to line twenty family-style plates on which Kofoed would nest “dill stones” – nuggets of cured mackerel dipped, repeatedly, in gelatinized dill juice (alternating with liquid nitrogen) to create a shiny, green coat. They really did look like stones. Kofoed garnished these “stones” with feathery sprigs of dill and served them with a side of tangy horseradish cream. Together, it was a one-bite postcard from Scandinavia. Kofoed knew that he couldn’t accurately reproduce the food that he cooks in Denmark at The Restaurant Meadowood for the Twelve Days of Christmas. He focused, instead, on immersing himself in the local terroir, and drawing inspiration and ingredients from the land. He methodically combed the hoop house at The Restaurant at Meadowood’s garden at the Montessori School of St. Helena with head gardener Christine Kim for herbs, tasting as he moved from tray to tray. With these herbs, he ringed a bowl in which was poured a warm cheese and onion soup over pickled onions. Normally, he’d use a specific, aged cheese from Denmark. Here, he used a local gruyere that was most-similar to the Danish version, one with a sharpness that cut wonderfully against the sourness of the pickled onions. And, he took those red bay leaves we found in the forest and charred them, lending their smokey, spicy aroma to plates of deboned and stuffed chicken wings served with a creamy black truffle sauce. This dish really showed off the techinique-driven side of Kofoed’s cooking. Kofoed only brought one ingredient with him to Napa Valley – woodruff powder. This, he infused into a white chocolate cremeaux over which he poured a thin layer of gelatinized chervil juice and topped, table-side, with a spoonful of pine tea granité. 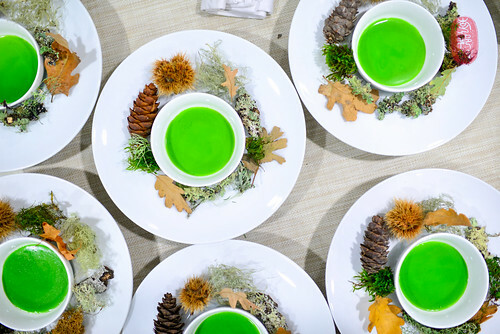 To complete the smells and sights of the forests of Napa Valley and his childhood, Kofoed served this dessert with a garland of things we found on our hike through the woods with Rahtz – pine cones, wispy tufts of Spanish moss, bits of lichen, round-lobed leaves of oak, and spiny chestnuts. It was a beautiful and incredibly fragrant dessert, with wonderfully evolving flavor profile: almond extract gave way to flavors of matcha and coconut. It was beautiful. It was evocative. I loved it. Kostow presented one of my favorite dishes from my many meals at The Restaurant at Meadowood. It’s a delicate bean soup, which he garnishes with different ingredients, depending on the season. This night, Kostow coupled his beautiful assortment of legumes with slices of dried abalone. I also loved Kostow’s canapé of pommes soufflé, which involves a very classic French technique (a collaborative nod to Kofoed’s technique-minded cooking) of frying two laminated sheets of potato until they puff into a light, crunchy pillow. He filled these pommes soufflés with rutabaga cream and dusted them with buttermilk powder. It was like chip and dip, without having to dip. For dessert, Kostow also went into the woods. He pulled out spicebush, a plant with fragrant oils in its stems and dried blossoms. When fresh, it smells of melons and spice. When dried, the rounder, softer melon notes disappear, and the spicier smells become sweeter and warmer. Kostow infused the spicebush into a cake, which he glazed with a shiny coat of dark chocolate glaçage. It tasted of the forest, and of Christmas. 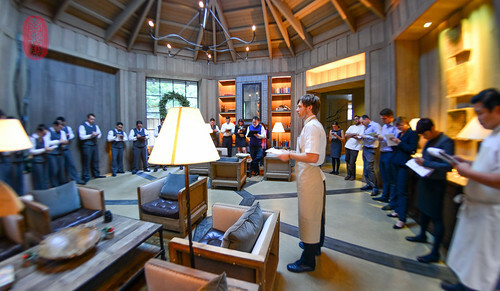 The entire menu from Rasmus Kofoed’s dinner, with wine pairings by the guest vintner Spring Mountain Vineyard is below, along with a slideshow from the ninth day of Christmas at The Restaurant at Meadowood. If you would like to see the photos in a larger size, click through the slideshow to the Flickr album. Coastal grasses, char roe, toasted rice milk. Ham jelly, thyme oil, the last flowers. 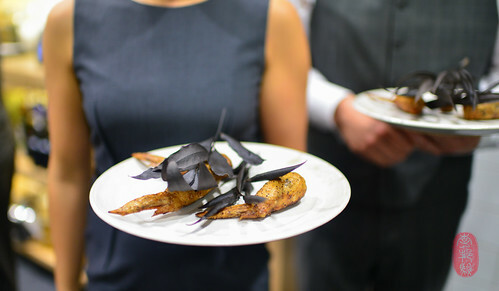 Photos: “Dill Stones” by Rasmus Kofoed; Rasmus Kofoed crossing a redwood trunk in the woods above Napa; stuffed chicken wing with burnt bay leaves by Rasmus Kofoed; woodruff custard, with chervil and pine by Rasmus Kofoed; Rasmus Kofoed at line-up. ~ by ulterior epicure on December 20, 2013. Hmmm, 8th course, I think.